Do you suffer from computer eye strain? maximum viewing comfort, the lenses of your computer glasses should include anti-reflective coating. 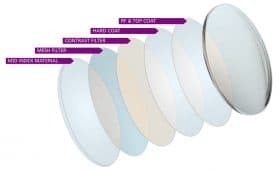 Sometimes called anti-glare treatment, anti-reflective (AR) coating eliminates reflections of light from the front and back surfaces of your lenses that can cause eye strain.